Novel immunotherapy drugs may be working well for some patients with mesothelioma, but not enough to satisfy Dr. Raffit Hassan at the National Cancer Institute. It’s not even close yet. Hassan was the lead investigator of a recent study that detailed the effectiveness of avelumab in a phase Ib clinical trial involving previously treated patients with mesothelioma. Avelumab showed a median 12-month progression-free survival rate of almost 20 percent, comparable to other immunotherapy drugs being lauded as the future of cancer care. Jama Oncology published the study in January. Hassan is the senior investigator of the Head, Thoracic and Solid Tumor Immunotherapy Section at the NCI’s Center for Cancer Research. He has played a major role in immunotherapy advances that are changing cancer care everywhere through targeted therapy. Standard-of-care treatment typically involves Alimta (pemetrexed) chemotherapy, the only FDA-approved drug specifically for mesothelioma. Only a small percentage of patients qualify for additional surgery. Unfortunately, fewer than 40 percent of the patients receiving just chemotherapy live more than a year after diagnosis. There currently is no FDA-approved, second-line treatment for mesothelioma, a role many oncologists believe one or more immunotherapy drugs will fill soon. Avelumab — a monoclonal antibody — works by targeting the cell-surface protein PD-L1, which is found in varying degrees in mesothelioma tumors. 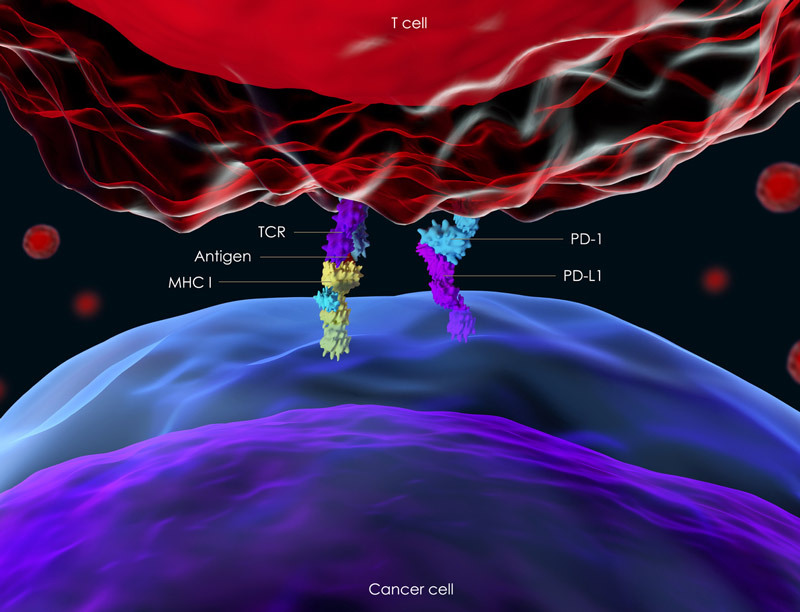 PD-L1 is what allows cancer cells to hide from a patient’s immune system. Avelumab works by neutralizing PD-L1 and unmasking the cancer, which prompts the immune system to attack the tumor cells. Hassan’s study involved 53 patients (average age 67) enrolled at 25 different sites. All patients had inoperable mesothelioma, either pleural or peritoneal subtype, and showed disease progression after their chemotherapy regimen ended. Patients, who were followed for up to 24 months, were given avelumab every two weeks until disease progression resumed, side effects became unacceptable, or the patient withdrew for other protocol-specific reasons. The objective-response rate was 9 percent, which included one patient with a complete response and disappearance of all tumor burden, and four patients with a partial response. Of the 48 patients whose data were assessed for change in tumor size, 24 experienced a reduction of some level. Most encouraging were the patients with a higher level of PD-L1. They had a median overall survival of 20.2 months and a 12-month overall survival of 72.5 percent. PD-L1 presence alone, though, is not considered the only factor in how well the drug would work. Other factors such as genetic mutations of the tumor and mesothelioma cell type can influence the effectiveness. Side effects were considered manageable. Only eight patients experienced a serious side effect. Avelumab already has been approved by the FDA for limited use in non-small cell lung cancer and certain types of stomach and skin cancer. Memorial Sloan Kettering Cancer Center in New York City recently opened a clinical trial studying the combination of avelumab and targeted radiation for mesothelioma. There currently are more than 50 clinical trials around the world involving avelumab — on various levels with a variety of cancers — testing the drug.